Not published, for some strange reason. Possibly due to the eye-watering length of the text. Used in Monaro Musings at roughly the same time. Many readers would be familiar with the name Cloudstreet (the folk music act, not the book. Maybe both. Let’s stick with the former for now). 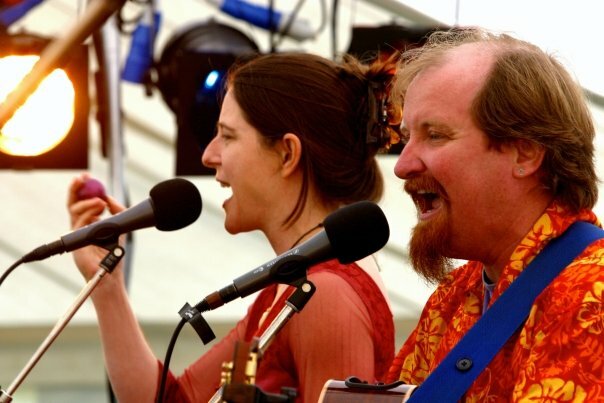 Nicole Murray and John Thompson have been plying their trade as individual performers for many years, and as a duo for about ten years, turning out fine studio albums and countless live performances in the process. I spoke to Nicole and John in April this year, following a post-National Folk Festival gig in Canberra, and then again to John in June, when Cloudstreet’s first live album had just seen the light of day. John and Nicole shared their views on singing, recording, live performance, and most importantly, what makes a really good cardboard box drum. Trad&Now: How was the National Folk Festival for you this year? John: Oh, the National was great. It’s an astonishing collection of Australia’s musicians. It’s the one festival that I know of in Australia where musicians will turn up, whether or not they’re booked. (Please don’t tell Dave O’Neill that!) It’s the place where everyone connects. The networking is phenomenal, it’s a chance to play with people that you see once a year, and you see them at the National. We had a few chances to get on stage even though we weren’t booked. But mostly we had a blast; it’s great fun. T&N: And Nicole, highlights of the festival for you? Nicole: Well, because we weren’t on the program, it was an opportunity for me to do things that were on the program because the National is a really participative festival and it’s a fantastic chance to just learn things. So I joined the National Fiddle Orchestra and got to play on the Budawang stage on the fiddle, which I’ve only been playing for three years. So that was a thrill, but the extra thrill was that my music teacher from Grade 9 and 10 in Townsville, Trish Barker, was there and we played together. She stood beside me and we played the tunes together, so that was a real connection for me. Apart from that I went to some workshops, more than concerts, because fantastic musicians of the highest calibre will teach you a couple of really useful skills. Nancy Kerr was doing Northumbrian fiddle playing and she’s a terrific teacher and taught some things to really ornament fiddle playing. And Jeremy Dunlop was teaching DADGAD guitar. Megan from Pastance was teaching ‘Catches, Canons and Rounds’, and I particularly went to that one because I’d read about catches, which are apparently songs that seem innocuous when you learn the parts but it’s when you put them together that the rude words come out. T&N: I hear you hit a rather high High C in the Infinite ‘Sound of Music’ competition. John: The Canberra Times compared me favourably to June Bronhill! T&N: Was it for the singing or the costume?! T&N: Was there anything that’s going to stand out for you that you’ll really remember the National for 2007? John: I dressed as a nun! Did I mention that?! Nicole: Actually, that’s probably the really big standout thing that happened to Cloudstreet which is that John is now famous for being dressed as a nun, or Mother Superior. But there was a gig that we were doing at the Troubadour where we were doing one of our songs, ‘The Fiddleship’, and a man on stilts went past and he started skipping in time to the jig – on the stilts. I hadn’t realised quite how loud we were – I could see that he heard us – but then at the end of the tune I said to the audience, ‘A man on stilts just went past at the back of the tent and skipped!’ And he’d gotten almost all the way to the session bar, and he turned around and gave us a huge bow, so it was obviously going right out into the festival. T&N: Your repertoire is a mixture of English and Australian songs. Compare and contrast the two, if you will, and a supplementary comparison: playing in England versus playing in Australia. Nicole: What’s really influenced us is the English harmony tradition, because there’s a really strong tradition of having a big sing-around. At a lot of festivals we’ve been to in England they have a resonant space at which up to a hundred people will turn up. And what they’re trying to do is to outdo each other with interesting chord notes, so I have learnt a lot of harmony ideas from the chord tradition. But in Australia there are also a lot of harmony singers and I think it goes through waves. Brisbane had a very strong harmony scene about ten years ago; it went for quite a long time, but it’s a little bit on the quiet side now compared to what it was then. John: Compared to the UK scene, the Australian scene is much more festival-based. We don’t have the same network of folk clubs. We do have some great clubs like The Merry Muse, but the UK seems to have a couple of thousand clubs. And their festivals seem to be much more focussed on the music and preserving the music; they’re less like the multi-stranded events that Australian festivals have become. Nicole: If I can add to that, they [UK festivals] are much less visually spectacular. If you go to the National, you walk in and you know you’re in a festival because there’s flags flying and people dressed up and it’s very hard to miss. Whereas we did turn up at Warwick festival and found it hard to find the festival site. T&N: And what’s next? A bit of a rest or still on the road? John: This is just a short trip; we’ve come down for the National and organised a couple of gigs around that. June sees us up in North Queensland, a little bit of time working up some new material and working on this new recording and then we’re off to the UK in late August. Nicole: And the other thing we’re doing in the next couple of months is a series of singing workshops in Brisbane called ‘Find Your Voice and Sing’. And we do that fairly regularly in Brisbane with a group called ‘The Voices’. As well as that we teach singing at festivals; we did it at Auckland and had a group of about sixty people – it was great fun. T&N: Finally, a burning question I’ve had all night watching this drum made out of a cardboard box – what is it you look for in a box when you’re fashioning a makeshift drum? John: It has to be empty! Nicole: For anyone who’s aspiring to play the cardboard box drum, get a rough one and get some brushes because the roughness gives it a nice sound, and then ask the sound person to turn down the bass response, because you don’t really need much bass when you’re really just playing a cardboard box, let’s face it! ‘Clouds on the Road’ was released in June, and includes a great selection of tunes Nicole and John have popularised in previous studio releases and their live performances. The last three tracks on the album sum up what makes Cloudstreet such an attractive, accessible and enjoyable live act for this punter: fun, parody, emotion, acappella, and the power to inspire the audience to a massed sing-a-long. They save the best for last: a rousing rendition of John Broomhall’s ‘Time is a Tempest’ (with additional lyrics by John Thompson), featuring stirring harmonies from behind the mics, and an audience that gets right into the chorus(es). While I’ve seen Cloudstreet sing the song live before, the CD version leaves your skin tingling, and you’re wishing you’d been there on the occasion of the recording, and that’s as good a recommendation for a live album track as any. T&N: So John, what have you been up to in the last couple of months? John: We’ve just come back from a tour of North Queensland based around the Palm Creek Music Festival just south of Townsville. We did gigs and a workshop in Yeppoon near Rocky and Mackay on the way north and then stayed in Townsville for a week and played a gig. Palm Creek was great; it’s a really vibrant local scene up there. It’s where Nicole and I met in the early to mid nineties. The music scene in Townsville was booming then, and it’s just carried on. It’s gone a couple of different directions; it’s a bit more bluesy stuff going on up there now. There were quite a few people into trad style stuff. T&N: What’s the demographic of Palm Creek like in comparison to other festivals? Is it an older crowd, a mixed crowd? John: I’d say it’s a bit more of a younger crowd compared to, say, the National, but by the same token it’s a much less traditional-based festival. There’s certainly room for trad in the mix, but it’s not necessarily the sort of music that gets people along to the festival in the first place. But I think that’s one of the great strengths of trad music festivals in Australia now; they tend to cross a lot of genre boundaries and expose people to different types of music that perhaps aren’t the reason that they went to the festival. T&N: Since you raise trad music, have you been reading the recent articles on the great folk revival? John: Yes, I’m in the second subject of the Grad Dip on Folk Life Studies that Graham Seal’s running out at Curtin University and I’ve been doing a lot of thinking on what is folklore and all that. T&N: Do you think there should be a fence around a very small community called ‘traditional Australian music’ and if you want to go outside of those boundaries at all you can go and play somewhere else, and call yourself something else? John: I think if you do that what you’ll have is a very high quality, extraordinarily small folk festival. You’ll have a meeting that could be held in a phone box that will be the envy of traditionalists everywhere. The music is necessarily resilient and I think that’s a big part of folk, be it trad or the more contemporary stuff that’s growing up. There’s a great quote of Martin Carthy’s that I came across recently which is that the only way to damage a traditional song is to not sing it. The folk music movement is ageing; I think in part that’s a reflection of there being quite a boom in folk in the late sixties and early 70s that hasn’t really been repeated since. It’s necessarily going to be the case that the people who were interested then are older now. And if they drove the movement for a long time then the people who are following that type of music, and that have been following it for a number of years, are just by the passing of time going to be an older group. But I think there’s a really startlingly talented bunch of younger musicians around. At the same time there’s a very big following of recorded trad, and overseas trad rather than necessarily Australian trad. But it’s still traditional music being played in Australia. I think that the Australian folk movement has been going through, and always has been going through, changes over time, and that’s necessarily going to be something that not everyone’s happy with. T&N: Speaking of recorded music, and getting back to you, what’s been the reaction to ‘Clouds on the Road’ so far? John: Given that we’ve had it in our hot little hands for two weeks, it’s been a little bit hard to gauge! We went on the road with it immediately, but we haven’t done a lot of pushing it yet. Publicising the album is something we’re going to get onto in the next couple of months. We’re really happy with the way the project evolved very, very rapidly and with the outcome. I’m really happy to have a record – something solid – of working with Rebecca Wright and Belinda Ford. There are a few four-part arrangements on the album that I think just take the songs somewhere different, they add a new dimension to some of the existing arrangements, and there’s a couple of new pieces. I’m over the moon about ‘Thousands and More and Tommy Peoples’‘, the first track – I just love that. T&N: Do you approach putting a live album together differently in terms of the track selection and the whole project than you would for a studio album? John: It’s our first live album, so it’s a bit of breaking new ground for us. It was interesting in a way because there was a bit of pressure to have new things included in it. But we wanted to give people a clearer idea of what we do when we’re on stage, without overdoing the intros because we know some people don’t like live albums. We listened to it and we thought every track we included, whether we’ve recorded it before or not, has something about it to recommend it. Whether it be using the four voices on ‘Wooden Spoons’ (which I think really gives it a terrific lift to what I think already is a great song), or the chance to do something like ‘The Calico Printer’s Clerk’ which we only learnt for Keith McKenry’s ‘Australia’s Lost Folk Songs’ concert at the National. And then we did it in Sydney a week afterwards which is where the recorded track comes from. We’re conscious that it’s the third time we’ve recorded ‘King Willy’ in five albums, but the arrangement keeps changing! We had a couple of people who’d bought earlier albums mention, ‘But that’s not how you sing it’. T&N: Do you find people get wedded to the way a song’s sung? Does anyone ever say about your arrangement of ‘The First Time Ever I Saw Your Face’ that it’s not how it sounds? John: Absolutely. And that was a big thing for us too: breaking that mental pattern of “’The First Time Ever I Saw Your Face’ can only be sung the way Roberta Flack sung it”. And we did deconstruct it a fair bit. T&N: Do you have a preference for straight voice? Do you feel the instrumentation is better or just gives it a different dimension? John: We tend to come to songs with a bit of an idea in our heads of how it should sound or how we would like it to sound, and that really governs whether we use instruments or just straight vocals. Sometimes it’s the feel of the song, sometimes it’s the subject of the song. With ‘The First Time Ever I Saw Your Face’ it was nice to pull it back because although the version that people mostly know is either Ewan McColl’s version or Roberta Flack’s, they’re both fairly minimal in their instrumentation – the voice is the thing. And we decided to pull it back even further and just use voice. But it really depends on the song and whatever it is about the song that appeals to us. ‘Time is a Tempest’ I heard on Alan Scott and Keith McKenry’s album where Alan played concertina, and the song immediately struck me as being something that would be great for large groups of people. Of all John Broomhall’s songs, it’s the song that particularly grabbed me. I hadn’t heard his stuff until some time after I’d recorded ‘Time is a Tempest’ with Martin Pearson because it’s on the ‘Never the Twain – Live at the Pod’ album, once again with a bunch of people singing it. It was nice to add the others in and Nic singing the harmony on the verses I really like too. It’s just such a lift when the crowd comes in, and to have Belinda and Rebecca on there as well. T&N: So when you’re recording the songs, do you feel any extra pressure like, ‘Oh God, we’ve got to nail this one because it’s going on the album’, or is it a bit more relaxed? John: No, that was the really nice thing because with this album, we came back from New Zealand with a bunch of tapes. It was a very last minute thing. I took a borrowed DAT recorder to New Zealand with me, bought a bunch of tapes the day before we left, thinking ‘Let’s see how it goes’ and see what we come back with. We spoke to our sound man that we were using just before we went to the National, with pretty much the idea that we had enough for an album. T&N: Is it something that you consider when you’re doing your sound, to capture the audience reaction? In a way it feels like it’s a really nice project to tie off material that we’ve been touring with for the last year and add something a little more to it. We’ve had people asking us about a live album for a while, and yeah, just everything came together. I certainly wasn’t expecting to be back in the studio, in this case for the mastering, so soon after ‘Dance Up the Sun’, which was only March last year. T&N: That’s quite prolific for a lot of folk performers! John: It’s album number five. It frees us now to really get stuck into writing some more material. When you’re on the road it’s quite difficult to write, at least that’s what we find, and when you’re touring, there’s an expectation from the people that follow you a lot that there are certain songs that you’ll perform. For us ‘The Briar and the Rose’ is a song you’ll hear at most gigs. And that’s not necessarily a bad thing – it’s a beautiful song and I’m very, very fond of the arrangement that we’ve put together. You have to balance the justifiable expectation the audience has of hearing their favourites. You have to balance out investigating new material and maintaining your own energy and interest in the music with, at the same time, maintaining your musical identity. It’s like most things, it’s a balancing exercise between continually redefining what your music is and playing what is identifiable as your music to your audience. John: Oh yeah, and I think that bands like Fairport Convention must struggle with that constantly, because they’ve got such a back catalogue of classic music. The line-up, of course, is massively different from when they started. They put out albums at a great rate of knots, and regardless of how wonderful their new musical directions might become over time, people still want to hear the old Fairport classics. I’m not suggesting that we’re anywhere near to that level of pressure yet. It’s one of the things that you have to balance out when you’re touring is that you don’t become stale by doing the same music over and over. I must admit that I’m still really, really taken by the music that we’re doing; it gives me a real buzz to do songs like ‘King Willy’. It’s fantastic and there’s always someone who’s never heard it before and I love watching them. T&N: Do you find that you get a different reaction between the traditional music, the covers, and the original stuff you’ve written yourself when you’re playing live? John: I know I’m talking about balancing a lot of things, but it’s a real thing for us to try to maintain some form of cohesion between the original material and the trad. Some people are drawn to the older songs. I suppose the line we tread in between is when we write songs, because we’re writing in the context of performing a lot of original material, we either try to put a spin on the trad songs to make them more appealing to a contemporary audience who may or may not necessarily have a great interest or following of trad. And at the same time we’re writing our own material in that type of style. We try to mix up the material that we do so that while there’s some cohesive musical theme running through it, we are more likely to appeal to a larger number of people with different interests. Things like ‘The Ballad of the Shape of Things’ surface in the trad scene from time to time but comes from a revue in 1954. ‘Violet Sarah and Hannah May’s’: ‘Violet Sarah’ is a traditional type of song in a sense because it tells a little story and it’s got that reference to ballad in it; the tune ‘Hannah May’s’ is just a modern tune – James Fagan wrote it. And yet I think that sits quite well with traditional music. You’re constantly trying to reinvent your music to put your own flavour to it. ‘Thousands and More’, a very trad English song, we sing it in a very much more modern way than it’s normally interpreted; I think of it as a Paul Kelly chord progression. And ‘Tommy Peoples’’ is a great Irish traditional tune that really doesn’t belong in the company of this traditional English chorus song. But put the two together and I think there’s a really nice energy. So I guess some people are taken particularly by the trad stuff, some people by the vocals. Even when we’re doing quite traditional sounding songs, like ‘The Miner’s Washing’, we try to put a bit of a contemporary spin on how we sing it. The fact that it’s two voices gives it a traditional feel, but some of the harmonies that we use you wouldn’t normally find in a traditional singing context. T&N: You’re off to the UK in August; what’s on the agenda? John: We fly to the UK on the 27th of August, and we’re into a mad rush of gigs. A very busy time in September and October, and we’re finishing up with a weekend singing workshop which we’re running at Maddy Prior’s Stones Barn* in Cumbria. Maddy runs singing and performing workshops there, and she has other people who come through and run them as well. And we’ve got the chance to be there for three days and teach some singing stuff. It’s really exciting, and enormously intimidating! Not so much the teaching, but doing it at her place. It’s really a great chance; we’ve been doing a fair bit of singing workshops in Australia and a bit in England during the tours that we’ve had; it’s one of the advantages of doing slightly longer tours that you get the chance to do projects like that. And this is a nice chance to get to expand the horizons a bit. T&N: And are you off to Woodford over the new year? JT: We hope to. We’ve put our application in like everyone else! ‘Clouds on the Road’ is available from Trad and Now etc. * Author’s note: My sincere thanks to John for clarifying for me prior to publication that he and Nicole are off to ‘Maddy Prior’s Stones Barn’ and not the lesser known ‘Maddy Stone’s Priory Barn’. Paging Doctor Spooner!